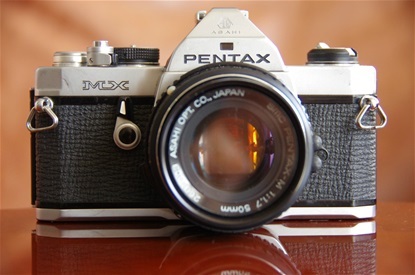 Only one year after the introduction of the K mount and the K series, Pentax launched the M series. 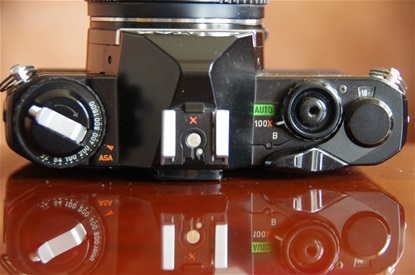 First of all, they wanted to make smaller, neater cameras. This led to new successes with the ME, MX and ME Super models. 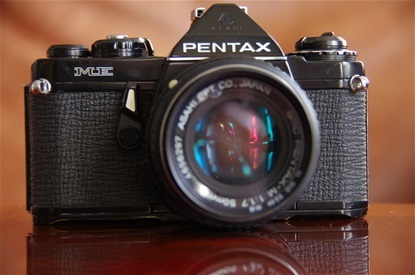 Another Pentax mass seller is born: The ME of 1976. 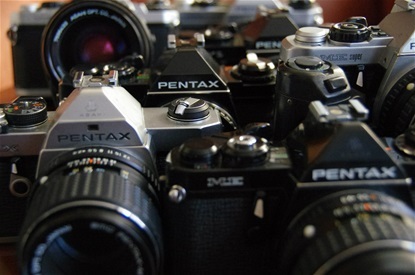 Measuring only 131x82,5x49,5 it is the smallest 35 PP SLR Pentax, so far. Weight: 460 grams. Sn: 1716473. 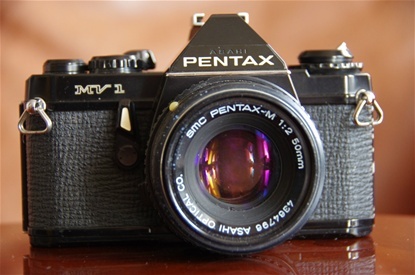 Lens Pentax SMC M 75-150/4. Note that for the first time the control dial has no manual mode. Off, Automatic, 1/100 flash speed and B are the options. 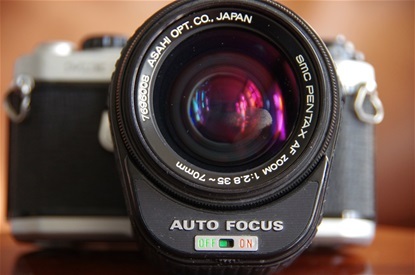 Lens sn: 7410037. 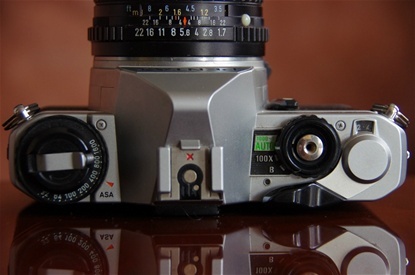 The MX was the all manual pro of the new compact M-series. Measures: 136x82,5x49,5: only 5mm wider than the ME. Weight: 495 grams. Sn: 9503279. 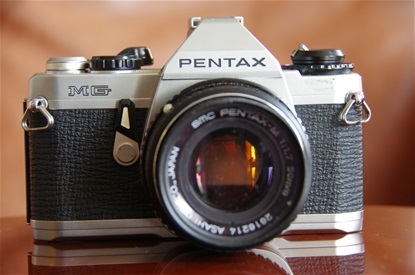 Pentax SMC M 100/2,8. Sn: 7098925. 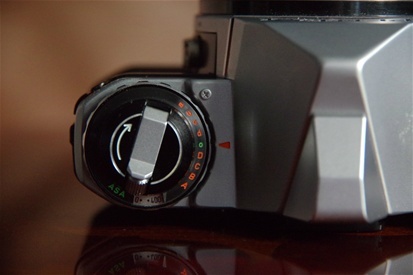 Full manual shutter dial. Possibility of winder with 1,5 frames per second, or motor drive with battery pack, giving 5 fps. The MV was supposed to take over after ME. It had the same functions; no manual mode, but was lighter. Size: 132x84x49,5mm. Weight: 420 grams. S/n: 3148833. 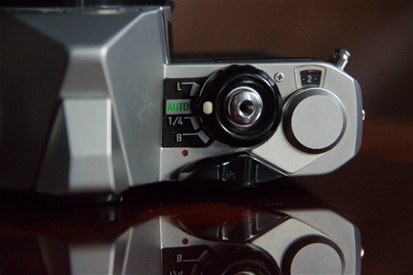 Even simpler than the ME: No off mode and no exposure compensation. 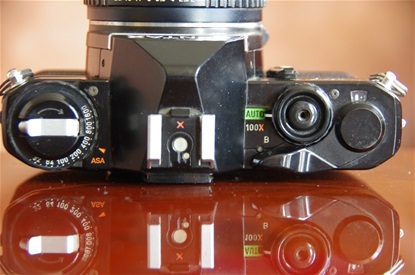 The MV-1 was released the same year as the MV, and was identical, except for the self timer and a coupling for external winder. Sn. 1729230. 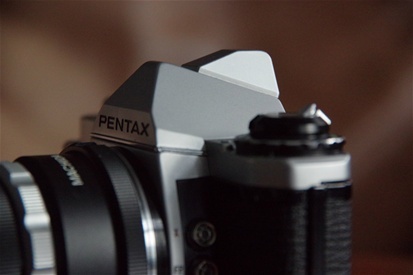 The Me Super was another sales success for Pentax. Built on the same sole as the ME, but had the manual mode like the MX. 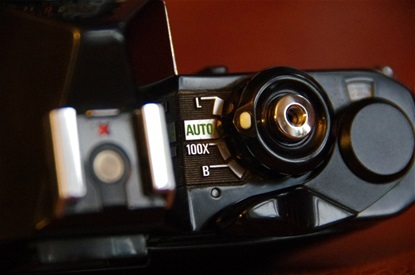 And: as the first camera in the world it came with push buttons instead of dials for shutter speed control. S/n: 2267313. The birth of the push buttons. A great thing at the time, but obviously slower than the dials in many aspects. They were to be used on the M series, disappeared on the P30 and reappeared for the last time with the SF series. 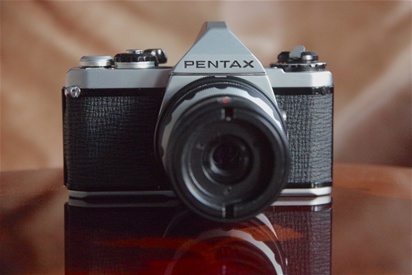 Another worlds first from Pentax, and a sensational one: the Auto Focus SLR. The motor was placed inside the lens and was driven by four AA batteries. Obviously not the final solution. The ME-F was produced till 1984. 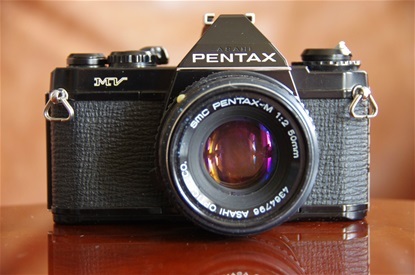 In spite of being first, Pentax was loosing momentum during the 80s, and was never to take back their leading position from the 50s, 60s and beginning of 70s. The AF 35-70 lens was big and heavy and was the only AF lens made for the ME-F.S/n: 7696433. The last M called MG. Simple as the ME and MV-1. Sn: 7319805. 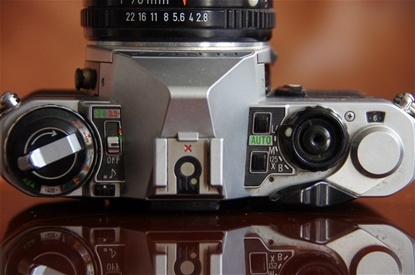 Just like the MV on top, but featured shutter speed readout in the viewfinder. 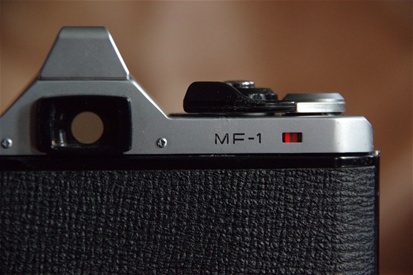 MF-1 is a special camera intended for medical use only. Sized like the ME, but some millimeters higher due to the extra room on top of the prism. This contains the spot meter, as there is no ground glass in the camera. The viewer is constructed to give a circular view, needed for the endoscope. Sn. 4061720. The spot meter is built in at the top, where the flash shoe would be. 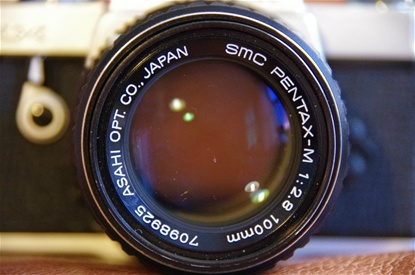 Unusual for Pentax: model name at the back. 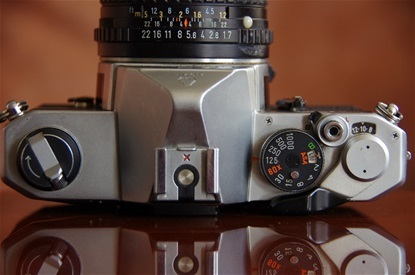 The MF-1 came with a kind of lens, divided into two. The inner part, a 35 mm open distance ring with sn. 8797, and the outer part, a lens with a focus ring numbered from 1 to 5. It is designed with a mount for attaching an endoscope. Sn. 8191. 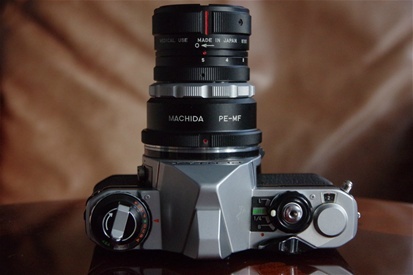 Both are made by Machida, Japan. Only L (locked), Auto, 1/4 and B.
Rewinder and film speed setting. So far, so good. But I have not found out why the a-d and A-D stops are there. Not easy to get any information about this camera. Hopefully, those who used it knew more.. Any idea? Please tell us. 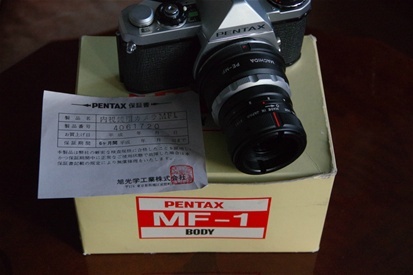 Since there is so little information about this camera, is there anything worth knowing on this document?